In this chapter, we challenge the presupposed concept of innovation in the responsible innovation literature. As a first step, we raise several questions with regard to the possibility of ‘responsible’ innovation and point at several difficulties which undermine the supposedly responsible character of innovation processes, based on an analysis of the input, throughput and output of innovation processes. It becomes clear that the practical applicability of the concept of responsible innovation is highly problematic and that a more thorough inquiry of the concept is required. 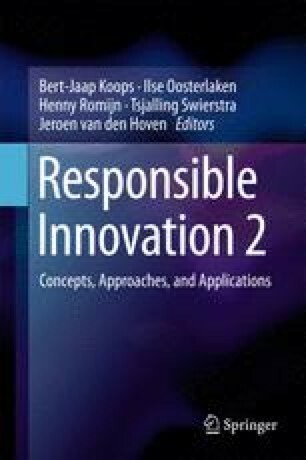 As a second step, we analyze the concept of innovation which is self-evidently presupposed in current literature on responsible innovation. It becomes clear that innovation is self-evidently seen as (1) technological innovation, (2) is primarily perceived from an economic perspective, (3) is inherently good and (4) presupposes a symmetry between moral agents and moral addressees. By challenging this narrow and uncritical concept of innovation, we contribute to a second round of theorizing about the concept and provide a research agenda for future research in order to enhance a less naïve concept of responsible innovation. This article owes much to the inspiring discussions about RRI that the authors were fortunate to have with Henk van den Belt. Matter. 2011. A report on responsible research & innovation. Available at: http://ec.europa.eu/research/science-society/document_library/pdf_06/rri-report-hilary-sutcliffe_en.pdf. Netherlands Organisation for Scientific Research (NWO). 2012. Responsible innovation research program. Available at: http://www.responsible-innovation.nl/conference/conf11/index.php?option=com_content&view=article&id=24&Itemid=34. Technology Strategy Board. 2012. Responsible innovation framework for commercialization of research findings. http://webarchive.nationalarchives.gov.uk/20130221185318/www.innovateuk.org/_assets/responsible_innovation.pdf.